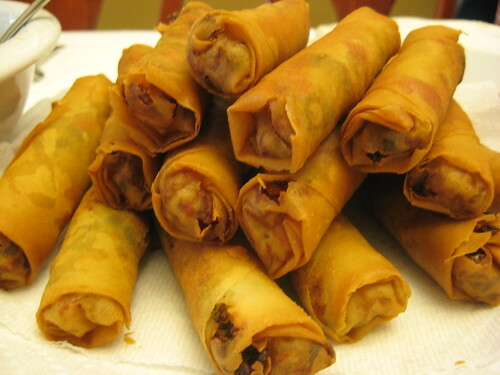 Hey… It’s How My Mom Rolls (Lumpia)… | Hapa...Shot the Food! While the Filipino and American culinary traditions are her base, she’s not afraid to tweak her tried-and-true recipes or experiment with new recipes… I’ll have more shots of some of her creations in future blog posts, but let me focus on one dish today. Many Asian cuisines have their own variation of the Spring Roll. 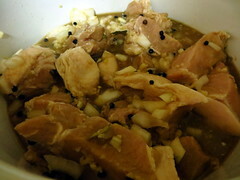 The Philippines is definitely no exception, making a version of the dish as Filipino as Adobo. 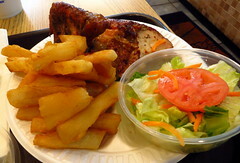 Lumpia can be prepared fried or fresh, and its thin wrapper is usually filled with meat (pork is most common) and/or vegetables (usually carrots, green beans, and/or cabbage….sometimes bean sprouts). Sometimes seafood can make its appearance in the filling, and it even can be filled with banana and/or jackfruit (the latter version described is a snack/dessert called Turon). 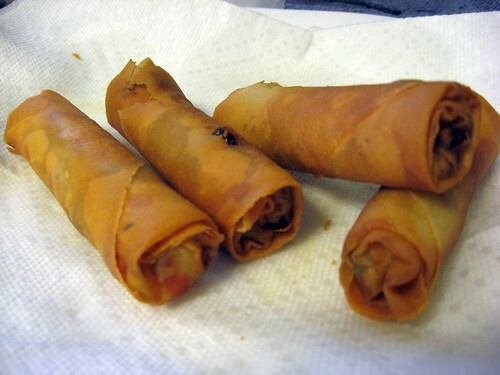 While Dan, his parents, and I were visiting my parents at the end of May, mom made Lumpiang Gulay (Vegetable Lumpia). 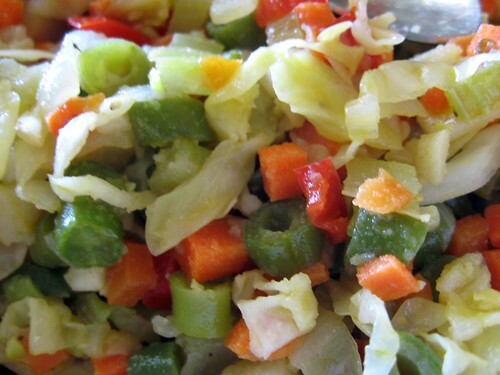 The filling was a colorful array of carrots, cabbage, green beans and red peppers. Sometimes Mom puts jicama into her vegetable mixes for lumpia, but I forgot if it was in the mix or not since it’s been a couple of months. 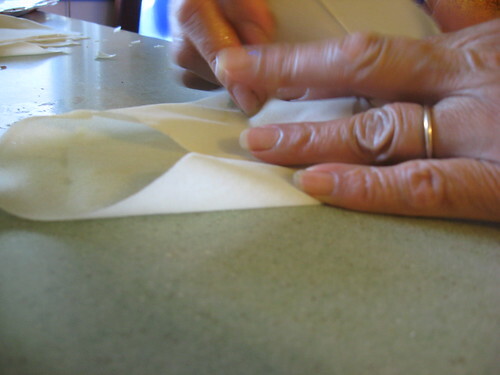 Lumpia wrapper is ofter made out of cornstarch/flour, egg, and water. If one doesn’t want to make it from scratch, pre-made wrappers can be found at many Asian stores (and even some supermarkets depending on where you live). In this picture, mom’s already folded opposing corners of wrapper (and I think the bottom as well) around the filling. 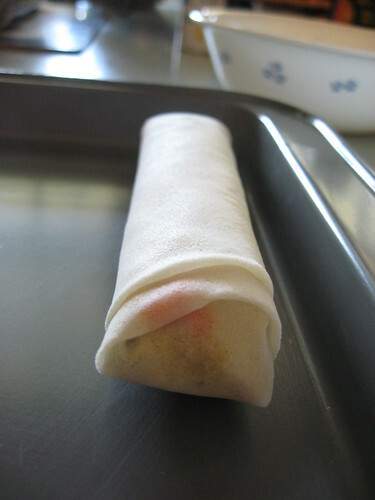 She’ll put eggwash on the remaining part and roll the filled wrapper from bottom to top. Sorry… no recipe here this time. Mom tends to eyeball a lot of things nowadays, and…well… she was pretty surprised when I let the family banana bread recipe out of the bag (Not necessarily in a good way. Oops…). 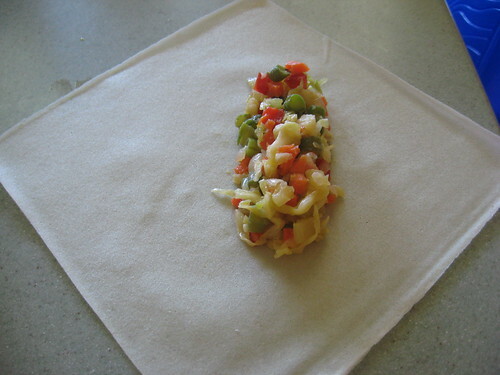 *A shout-out to fellow food blogger Burnt Lumpia, who’s celebrating the birth of a Baby Lumpia. He’s the one who wrote the lumpia guest-blog I linked to in this entry. 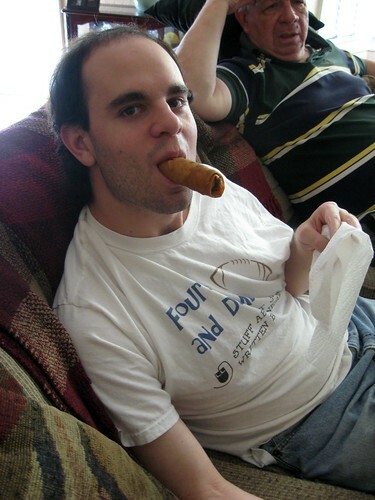 Posted on August 21, 2009, in Asian, Filipino, Uncategorized and tagged lumpia. Bookmark the permalink. Leave a comment.